A little while back we came into possession of a number of 1950-era issues of California Checker Chatter (CCC). The checker scene in California certainly seemed to be active in those days; the magazine talks of clubs in Oakland, Santa Monica, and other places around the state. Out of those yellowing but fascinating pages from the past we've chosen our topic for today: the CCC "Prize Problem" for November, 1948. But, subsequent to publication, the "star" line was found to be faulty, and the problem flawed. The original premise was this. 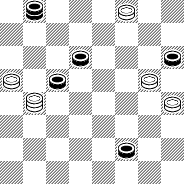 The problem composer, a Mr. Hawkins, had proposed 3-7 15-19 7-11 18-23 11-16* to a White win. But we'd best remove the star from that last White move, because a Mr. K.D. Hanson came along and showed a draw for Black. Here's the situation after 11-16. Can you take the "prize" out of "prize problem" and find the Black draw? Click on Read More to check your solution. 19-24 16-19 23-26 30-23 32-27 19-28 27-18 28-24 21-25 24-19 25-30 20-16 30-25 16-11 6-10 13-9 25-22 17-13 18-15 Drawn. Instead of 11-16 as the move leading to the second diagram, CCC recommended 17-14 as the best move. Checking with our computer, we find that KingsRow rates 11-7, 30-25, 17-14, and 11-16 all at -1; and 20-16, 11-8, and 11-15 at +1. -100 would be the equivalent of a full piece advantage for White and +100, a full piece advantage for Black. A margin of +1 or -1 is infintesimal, and clearly a draw. 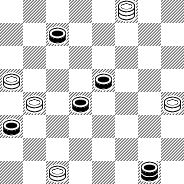 In other words, there are half a dozen or more drawing moves for White, but nothing better. Prize withdrawn?